by Douglas Skinner • April 12, 2017 • Comments Off on Are You Prepared for Sudden Cardiac Arrest? 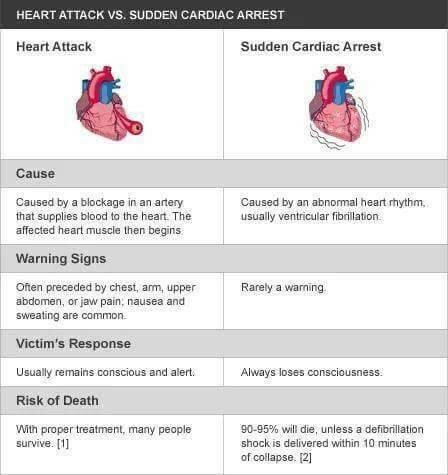 You can’t choose when a Sudden Cardiac Arrest will strike. But you can be prepared. Sudden Cardiac Arrest can happen to anyone, anywhere, at any time. The incidents of out of hospital sudden cardiac arrest in the USA is 326,200 adults and 6,000 children annually (AHA, 2015). You say what is a “Sudden Cardiac Arrest” or SCA? Sudden Cardiac arrest is a condition in which the heart suddenly and unexpectedly stops beating (NIH, 2017). If this happens, blood stops flowing to the brain and other vital organs and time is of the essences to take action to restart the heart. So how does the heart work? The heart has two intricate systems with in it, 1. Electrical System and 2. Mechanical System. The electrical system controls the hearts beating by use of electrical impulses to help the hearts walls to contract. When the walls contract, the blood is pumped into the circulatory system throughout the body. The pumping action is completed by the mechanical system or heart muscles that pump the blood. The diagram below shows the electrical system within the heart and how it runs thru each part of the heart to help produce impulses that will contract the heart muscle to produce a heartbeat and pump blood. 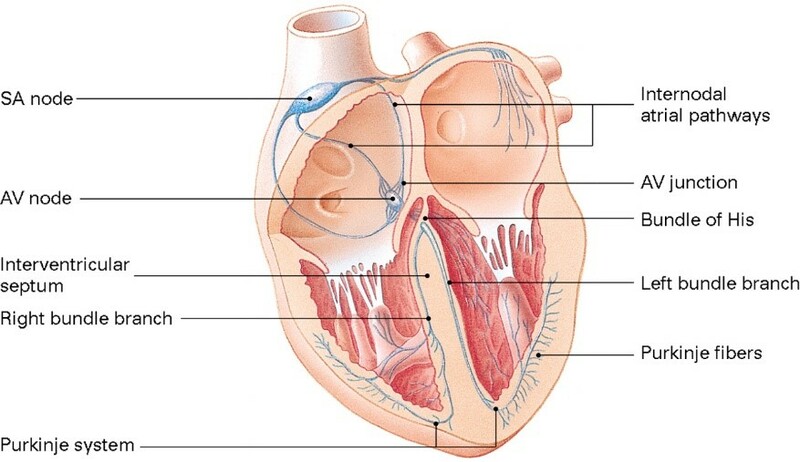 Diagram shows the hearts electrical conduction system. What causes a sudden cardiac arrest or SCA? Primarily an arrhythmia or electrical irregularity occurs within the hearts electrical system and causes the heart to fibrillate. This is called, Ventricular Fibrillation or V-fib, which causes the heart to stop beating, and the heart muscle to fibrillate or convulse or quiver within the chest. Certain disease and conditions can cause the electrical problems that lead to SCA, including coronary heart disease, physical stress, inherited heart disorders, structural changes of the heart and at time electrolyte imbalances that come with dehydration (SCAF, 2017). V-fib is fatal if not treated within a few minutes. SCA is not always a heart attack, and many times is confused with a heart attack. A heart attack is a sudden and sometimes fatal occurrence of coronary vessel blockage of oxygen rich blood resulting in the death of a part of the heart muscle, as seen below (NHLBI, 2017). Yes, this can damage the muscles of the heart and then cause SCA, but if treated appropriately and quickly a person can live a full life. Heart attacks present with chest pain or discomfort, shortness of breath, cold sweat, pain radiating to arms, jaw or neck, feeling tired, nausea and light-headiness. See the diagram below that differentiates between a Heart Attack and Sudden Cardiac Arrest. Proper treatment of a heart attack includes quick action from you and 911 EMS systems, to treat and transport a Heart Attack patient to the closest heart hospital. Diagram shows the difference of heart attack and SCA. What’s the treatment of SCA? The primary treatment is quality CPR and defibrillation with an automatic external defibrillator. A defibrillator is a device that sends an electric shock to the heart to restore its normal rhythm ad along with quality CPR can help to save the life of a SCA patient. After the primary care, quick and efficient Emergency Medical Service Advanced Life Support with advanced airways, IV’s, and medications, with rapid transport to a heart center are key to assure optimal patient care for SCA. How can you help or your organization help? The public and local organizations are key to a well-defined and quality SCA response and treatment system. If each person learns quality CPR and has the capability to use an Automatic External Defibrillator or AED, the chances for survival of SCA patients will increase. Learn CPR and encourage your organizations you affiliate with to purchase and properly place AED’s in their buildings to help save a life. To Save a Life: Learn CPR, Encourage Organizations to purchase and place AED’s within their facilities. 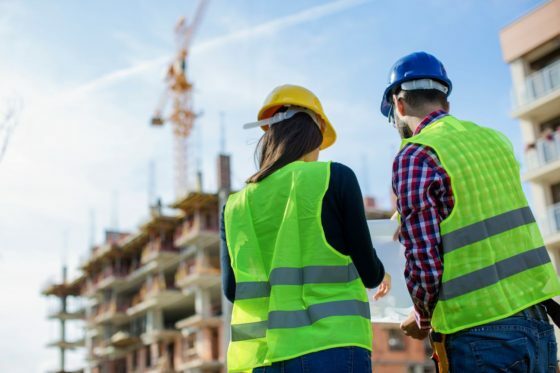 If you have questions or need help with training or AED equipment needs please contact SCS Safety Health and Security Associates at (703)-779-7330 or dougs@scssafetyandhealth.com.